Mango, Topshop & More | Here's What We Bagged From Sarojini's Export Surplus! Light on the pocket, high on style. Sarojini Nagar is undoubtedly every girl&apos;s fashion genie, for it brings all our fashion fancies to life! Since it houses a bevy of good quality export surplus of various national and international brands at prices that are dirt cheap, we shimmied our way to this paradise to get our hands on the best branded clothes it has to offer. Read on to know what brands we did bag on our jaunt! Who’s to say that Topshop isn’t available in India?! Sarojini Nagar has it all. Whilst strolling, we stumbled upon a quintessential Topshop crop top laden with black and red checks. We knew it was a true catch, and bought it without a second thought! The material is a little thicker and warm from within, making it the perfect top for the upcoming winters. Next we came across a mind boggling range of cute summery crop tops from Abercrombie & Fitch. Yes, from the stupendous American brand in the midst of the jam-packed lanes of Sarojini. We chose the sky blue, floral top. Funnily enough, it’s from kids’ section, and can easily be carried off as a cutesy and pretty crop top for us! While strolling a little more, we came across this gem of a shop that housed the finest quality export surplus. We found one of the classiest and most authentic Mango pants donning white and blue stripes and it won us over in a jiffy! The pants are more like palazzos that can be paired with literally anything, and so we we simply whipped out our wallets and bought ‘em! 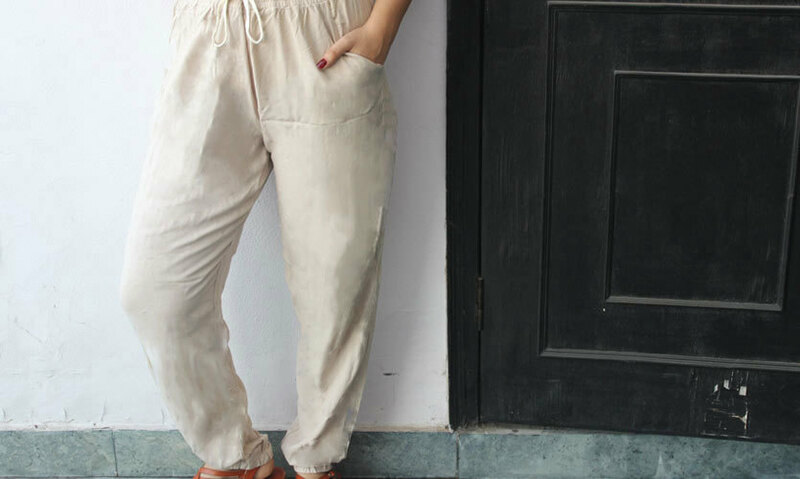 Since khakee pants are a wardrobe staple these days, we were longing for a good pair of them and like always, Sarojini had our back. Sitting in a hushed, secluded shop, we found our khakee pants, and that too of the international brand, atmosphere. Woah! Seriously, you need to come on over girls! A haven of partywear clothes, Shop No. 99 is literally everyone’s last minute party saviour and so we went there and found ourselves something truly awesome! A Guess Corset. How cool is that? Made with cotton and crafted in the elegant shape of a peplum top, this one can be used for a chic day party! #QuickBargainTip: Be a devil&apos;s advocate! Okay, we get that you really loved what you just saw and are dying to get it for your wardrobe. But to get it at the best price, you must control your excitement and instead point out a few loop holes in the garment. Take our word, their prices will come down in a jiffy. Head on over and hunt for yours. Happy shopping!